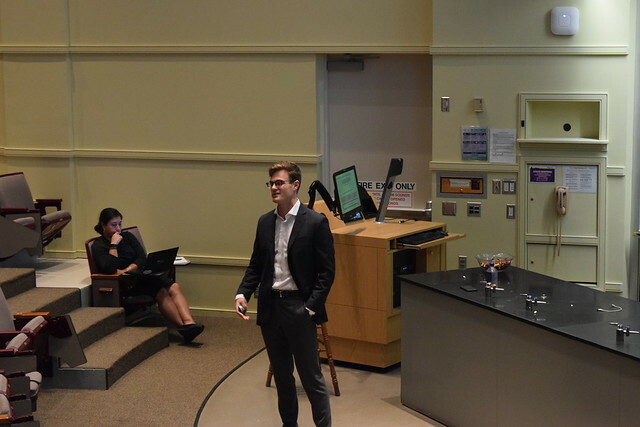 On Oct. 2, Jason Knafel of Fidelity Investments hosted “Realities of Overseas Investing.” The event was the fourth event in this semester’s Robert K. Wilmouth Speaker Series, a number of lectures hosted by NDIGI designed to further students’ knowledge of the science and art of investing. The objective of the event was to expose students to the potentially unfamiliar world of investing outside the United States, and the differences overseas markets entail. Jayson Knafel is a research associate in the equity division at Fidelity Investments. There, he researches public equities focusing on pharmaceuticals, medical equipment/devices, and services/facilities. He is the lead analyst on over 50 companies, responsible for recommending and monitoring investments for Fidelity’s more than $800 billion of actively managed mutual funds. Internationally, he focuses on both developed and emerging markets. He earned his Bachelor of Science in Finance from the University of Notre Dame in 2016. Fidelity Investments is a leading provider of investment management, retirement planning, portfolio guidance, brokerage, benefits outsourcing, and other financial products and services to more than 20 million individuals, institutions, and financial intermediaries. They invest in both public and private equity, having a team of diversified and sector-specific strategists to successfully maintain the variety of portfolios they manage. Fidelity has $2.6 trillion in assets under management and is headquartered in Boston, Massachusetts. Knafel began his presentation by discussing how international markets can be quite different from more familiar domestic markets. “International markets and investments,” he said, “don’t always operate the same as they do here. There’s a few reasons for this, including cultural and business norms, regulation and government oversight, and investor sophistication.” Other reasons for these differences include disagreements around shareholder rights and good management, corporate governance issues, and different time horizons. He then spoke about what exactly creates efficient market pricing. An efficient market is one in which asset prices are not predictable but random. “Markets,” he said, “are more efficient when there is a higher number of institutional investors.” The United States has the highest number of institutional investors of any nation, leading to markets and pricing that is more efficient than international counterparts. International markets, explained Knafel, often have less efficient pricing mechanisms than domestic markets. Less efficient markets can lead to dislocated prices for longer periods of time, the implications of which include an inability to simply trust “financial analysis.” Fraud is also more prevalent due to more relaxed regulations. Because of this, investing internationally has the potential to be a dangerous venture. Still, Knafel emphasized this does not mean international markets do not generate returns, and that diversifying one’s portfolio is a wise choice. Each of these three investments failed for different reasons, teaching Knafel invaluable lessons along the way. “You can’t always trust what’s going on with reporting,” he said. “Look at the cash flows. Look at the financial statements.” He also stated that management in foreign countries may have different priorities than Western management teams. Many Chinese managers, for example, are intensely focused on quarters because they withdraw funds on a quarterly basis. Accounting for differences like these will allow investors to have a greater understanding of international markets. For more information on Fidelity Investments, click here.